Free parking, but if you wish to order online please select your required size and email the image to ji11y@yahoo.com. If you are concerned the image is not suitable by all means email it first to check there is enough to wrap around the edges. High quality canvas prints, using art canvas and not vinyl. 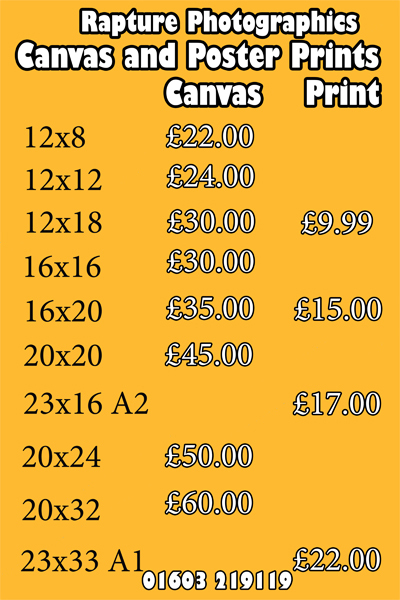 If you require one quickly we can have a stretched canvas complete by next day. Poster prints on high quality papers on our large format printer with K3 inks. A1 or up to 24 inches is our largest print size. But we can do 24 inches by a whole roll in length if you so wish!! We also print on other media paper such as fine art papers for limited edition prints. Please contact us directly for prices using hahnemuhl papers. Students, please contact us for discounts for exam work.